We’ve seen this before. As a matter of fact, it happened in February when the S&P 500 declined over 10%. As of today, the S&P 500 is down 9.4% in the last 24 trading sessions. No one ever said it would be easy to be an investor in the equity markets. During times like this people ask me if we are receiving many calls from clients. I am so proud to tell them that we have not received one call from a client concerning the market. They are dumbfounded when they hear this. I explain to them that our clients (You) have the correct allocation for your stage in life, are very well diversified, only invest in what we consider quality investments and focus on the long-term (lifetime) results. Therefore, we don’t panic when the market takes these temporary declines. While there are many speculations as to what is causing this downturn, please remember that the economy is growing at 3-4%, unemployment is historically low and corporate earnings are consistently growing 15% year-over-year. We simply do not feel this is a long-term trend. 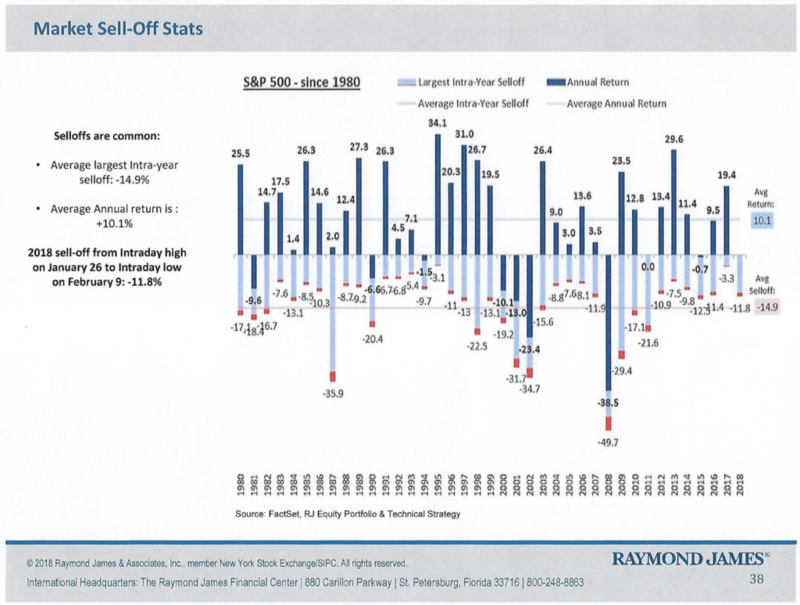 Most likely this is a typical intra-year selloff that over the last 37 years has averaged 14.9% while the market has averaged a 10.1% average annual return (see chart). We are so proud of you and your ability to focus on the results over years and decades, and not on months or weeks. As your partner for success we want to do everything in our power to help you and your family succeed in every way you define it. Of course, you are always welcome to call and we promise to stay in contact through the year and continue the focus on you and your family.